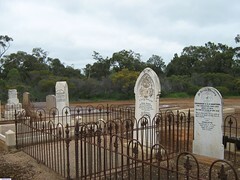 The provision for a cemetery was made when the land was surveyed for the parkland and reserve area at Barabba. The grant of land was proclaimed and granted on 13th January 1875 and signed by the Governor of the state, Sir Anthony Musgrave and countersigned by William Everard, Commissioner of Crown Lands. The first trustees were: James Harris of Hundred of Alma,Robert Dyer, George Fidge, James Hennessy,James Poulton and James Searl of Hundred of Grace, Edward Wall, James Dow and Alik Crawford of Hundred of Dalkey. In April 1875 when James Harris became the first curator he called for tenders to fence the cemetery.The land contained in this area was cleared of vegetation while the surrounding scrub land was retained. It is recorded in the lease book that Mr.Smith purchased the first burial allotment on 9th December 1875 and the second allotment to be purchased was recorded on the 22nd June 1876 by Mr. James Murch. Up until 1900 there had been 23 leases sold. For over 90 years the management of the cemetery was carried out by the district residents regularly meeting to appoint the trustees and officers. 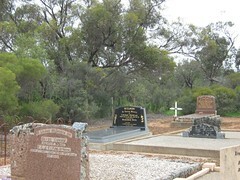 The cemetery in 2010 is under the Care and Control of the District Council of Mallala. 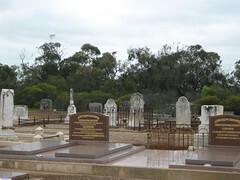 Do you remember Barabba Cemetery ? Then Join up and add your memory here.